A fully diversified portfolio isn’t quite complete without the addition of gold bars. However, when making an investment in precious metals, it is important that you take the necessary steps to protect your investment and ensure the quality of your holdings. One way to accomplish your investment goals is to only purchase high quality gold bars. One such bar is the UBS Gold Bar. 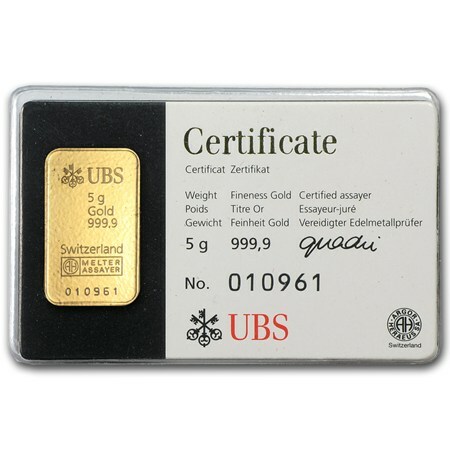 UBS Gold Bars are sought after due to their rarity, and are currently only in production in Switzerland. They derive their name from the Union Bank of Switzerland, the largest bank in Switzerland, which is affiliated with the “Royal Class” of people. Their UBS precious metals division is one of the largest in the world, and their clients include monetary funds, central banks, private clients (members of the Royal Family, kings and queens), investment firms, and top-tier precious metal dealers. These bars are manufactured and refined by the Argor Heraeus of Switzerland. This entity is part of the Good Delivery process of the London Bullion Market Association that helps to ensure that only the best individuals and entities are affiliated with the manufacture, processing, and delivery of these metals. The Good Delivery System is comprised of a select few accredited refiners and assayers. These entities are responsible for affixing unique stamps and serial numbers to the bars before they ship them. Being part of this system is considered a tremendous honor, and those who are part of it work hard to maintain their prestigious positions. Therefore, all entities associated with the system follow stringent guidelines. The bar itself contains a hologram on the back that contains a unique certificate number. It is one of the purest bars in existence with 99.99% purity. They are available in 1- and 10-ounce denominations. Many investors prefer to add these bars to their Individual Retirement Accounts as a way to safeguard against the weakening United States dollar and general inflation. If you would like assistance in adding the UBS bar to your IRA, contact American Bullion at 1-800-326-9598 to speak with a Gold IRA specialist.